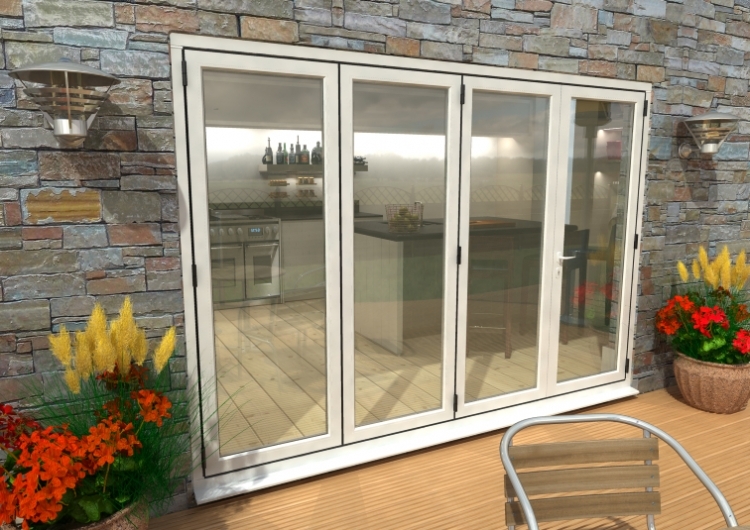 Climadoors new range of White Thermally broken aluminium bifolding patio doors give you high quality, standard off the shelf solutions for your aluminium folding doors. Set in a range of sizes from 1800, through to 4800mm, manufactured with an Hipca White finish these sets are ideal for the self builder, designer, or developer to "design in" a standard product with ease, knowing that the final solution, offers everything you see on screen - before you start. This 3000mm 4 door set will comply with Part L of the building regulations with Low U value glazing ( 1.2w/m2K), and are supplied as standard, with high security multi point locking, with matching colour handles and hinges. Available to see in our showroom. Easily installed and set up, all doors come preadjusted, meaning little or no adjustment on site, once the frame is set correctly, and can be installed in a matter of hours using the easily followed fitting instructions supplied with the set. Glazing supplied loose for ease of installation of doors. We can offer a huge range of made to measure sizes in folding, french and even aluminium flush casement windows too - just email us at sales@vibrantdoors.co.uk with your size and specification and we'd be happy to quote. Low E, 24mm Argon filled double glazed unit using toughened tempered safety glass with a 1.2W/m2K rating.